The Northern Hemisphere oils have finally arrived. So, the Southern ones must go! On sale while supplies last. To ensure we are always offering the newest and freshest oils in the world we must cycle through varieties and pressings quickly. Our rush is your gain! 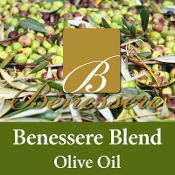 This blend is composed of four or more varietals. Ever changing flavor profile. This blend should be used within four months of purchase for maximum quality.